As the mists of morning lift, the residents of Krawk Island noticed a strange Ship in their harbour... The Cyodrake's Gaze. As the ship arrived at the Krawk Island Harbour, we learn that Hoban, the ship's navigator had fallen overboard and is nowhere to be found and cannot be searched for until the ship is repaired. Three days later, the ship suddenly disappears, presumably to search for Hoban. At this time, none of the pages related to the Cyodrakes Gaze are available. Two more days later, the ship reappears off the shores of Mystery Island and while the crew is gathering supplies, Kentari, the ships weapons manager and owner of Wonderous Weaponry, tells his account of how Hoban may have fallen overboard. Three days later, the ship set sail again. Another couple of days passed before the ship showed up in Faerieland of all places! (You didn't think it could fly?) This time, we heard the ship's cook, Chef Bonju's account of what happened. As you may have guessed, the ship disappeared four days later. The Lost Desert?!? Of course, thats the most logical place the ship has been yet! This time, we got to hear Linae's version of the story. Where on the ship did he fall? 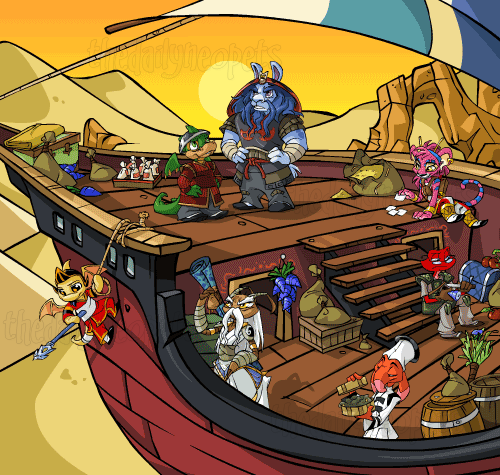 As well as trophies and items, if you got two or more questions correct, you recieved the Cyodrake's Gaze site theme and the "Aisha - Hoban the Navigator" avatar. After the guessing and prize giving, the ship and most of the plot pages disappeared and gave way to Shenkuu, a new world with the same shops as the Cyodrake's Gaze had (click here to see what it looked like), go on, check it out !